The above drawing was done by my five year old hand back in 1986. I was obviously enamoured with my new love football. As you can see, mum has carefully labeled the main features of my ‘work’, and this really highlights what first captured my imagination when it came to the footy. And that’s what this post is all about. Just what was it that grabbed your attention when you first visited a footy ground, smelt a leather footy or opened your first packet of footy cards. Does your first trip to the MCG remain with you until this day? And what of today’s kids? Does footy still fill their senses and leave them entranced? Is it fantasy footy or some other new fangled technological advancement which captures imaginations these days? Or is it much the same as it was for us slightly older footy fans; the colours, sights and smells? The following is the result of putting the word out there for any old footy drawings people may still have lying about, to give an indication of why people fell in love with the game. 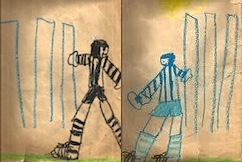 I was also keen and happy to receive a number drawings from kids growing up with football today. Let’s kick it off with one of the more recent pics sent to me by @MicLooby on twitter. 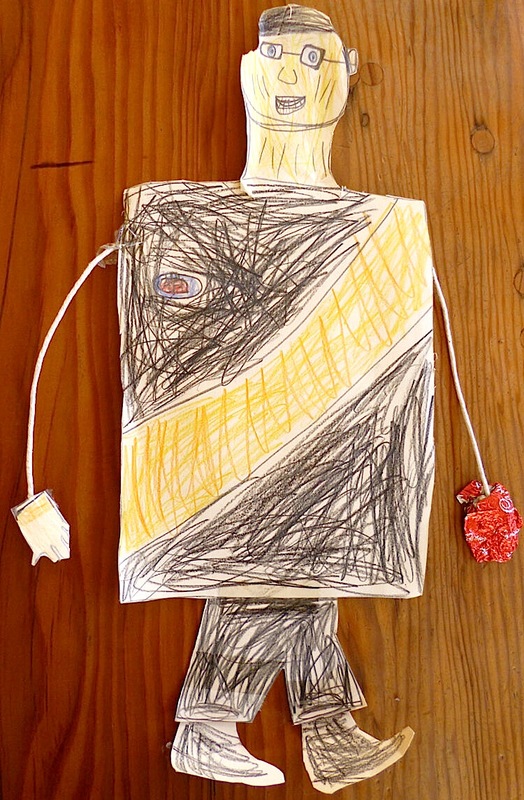 It is his 6 year old daughter’s 2012 grand final week ‘premonition’ of how events would unfold on the Saturday, and let’s just say that she nailed it! Simply a jubilant Adam Goodes, the premiership cup and a plethora of red and white confetti! It’s also a great attempt at the Sydney jumper, which is no where near as easy to draw as the regular stripes, sashes and hoops! 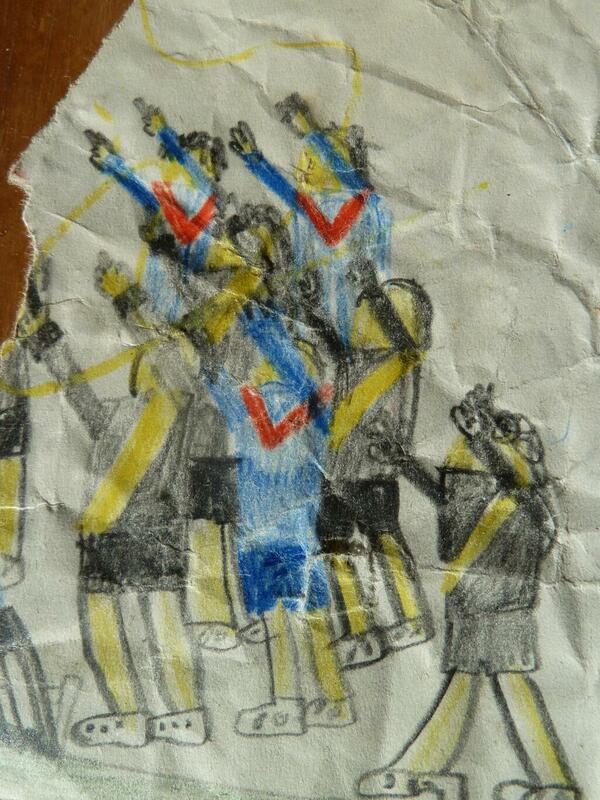 This was a picture my little brother Pete did after we attended a Footscray v Richmond match in 1993. As a 6 year old Doggie he sat there in tears early as his Dogs fell behind, but my Tigers crumbled and the result is his ‘happy’ memory of the days events. What I particularly love is how high the Richmond sock is travelling. This magnificent pic was sent to me on twitter by @atosha, and there’s so much to like about it! We can see a beautifully crafted Essendon man (Tim Watson) peeking out from behind the quintessential hooky board, although I’ve been assured that behind the cheesy smile, her Richmond supporting brother would have at some stage ripped ‘Essendon man’ to shreds. Typical Richmond supporters! 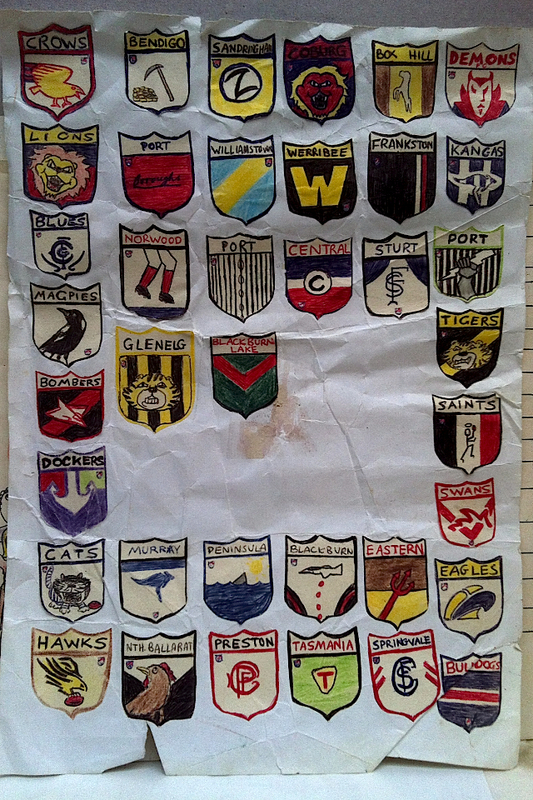 This drawing is by the fair hand of @TheIron_Sock, and dates back to the late 70’s when North and Collingwood featured in a classic drawn grand final. Unperturbed by Collingwood’s subsequent loss, young David depicted a North and Collingwood player sharing a kick to kick, smiles on faces, the sun out. And check out the intricate boot and lace work, along with the North players balanced kicking style. 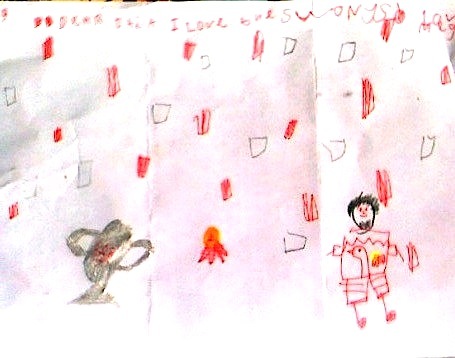 To contrast that picture we have a far more recent contribution from @RedRoverSays, this drawn by her 7 year old son and serving as her twitter profile picture for quite some time. I like the understated nature of the sponsors badge on the playing guernsey, the piercing blue eyes and the ginger-bread man quality this player possesses. It is in fact ol’ blue-eyed Jobe Watson. Continuing the close up profiles, we have another glorious picture sent to me on twitter by @4boat of his youngest sons drawing…of him! Given that his younger son isn’t into footy, this really meant a lot to him. Unfortunately the arms were copied from an old photo of Aaron Fiora, but I’ve been assured they are not an accurate depiction! I also love the tailored pants and shoes. Now this next drawing is one of my favourites. It was again sent to me by @4Boat, this time by his eldest son. Now I grew up with footy cards, but at best they had a photo on the front, a few stats on the back and came with a piece of chewing gum! What we see here however, in great detail, is todays footy card and the statistical footy world that our kids are growing up with. I particularly love his take on Nick Malceski; his face reminiscent of a 1930’s cigarette card. Speaking of detail, here’s a small glimpse into my brother’s mind. He went on a logo rampage, covering off on AFL, VFA, SANFL, Eastern Footy League, even our primary school’s nemesis, Blackburn Lake! I think he was joking with the Peninsula Dolphins…at least I hope! 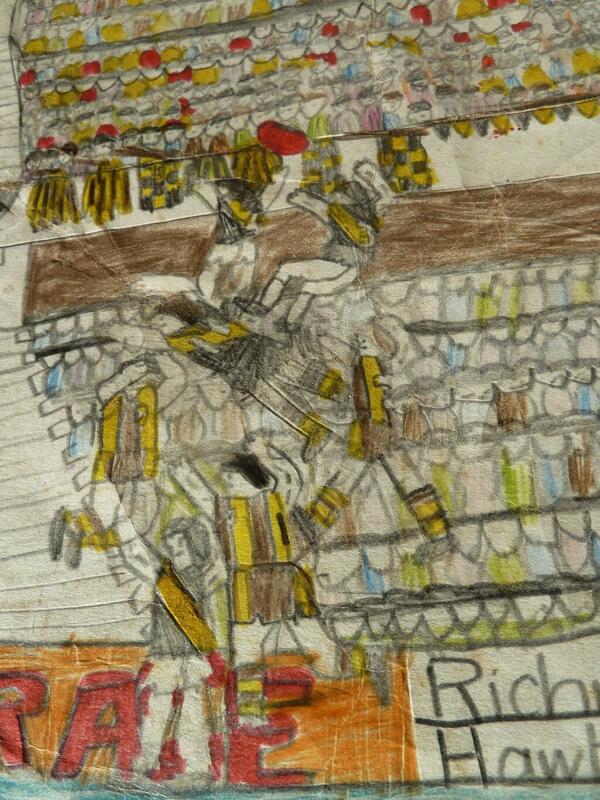 Here’s another hopeful piece I drew as a kid, obviously trying to tap into movie ‘Field of Dreams’ theory of ‘draw it and it may happen!’ It’s Richmond taking on West Coast in the Panasonic Cup grand final at Waverley Park. What I love is that most of the spectators in the stands are further away yet considerably larger than the players! 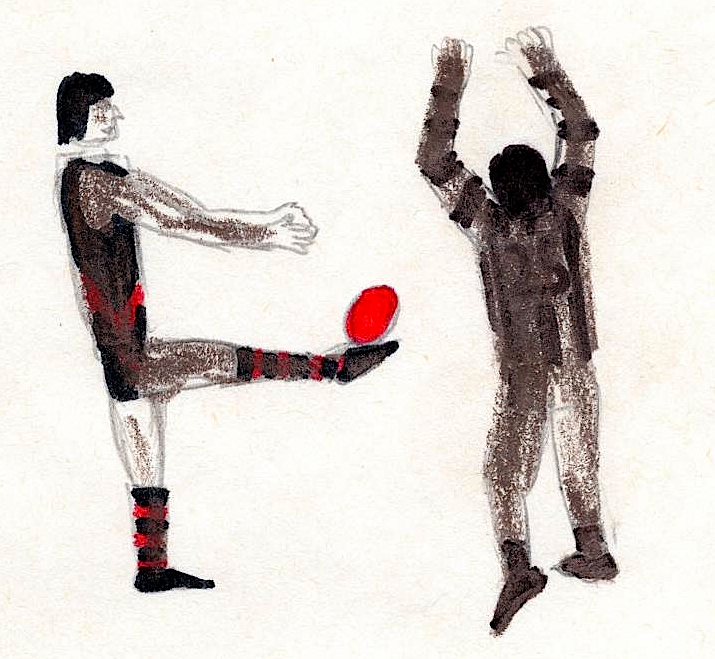 Continuing with drawings of footy action, here’s a great drawing sent to me by Mero, (@footyjumpers) who runs the comprehensive footy jumpers website (check my blogroll.) 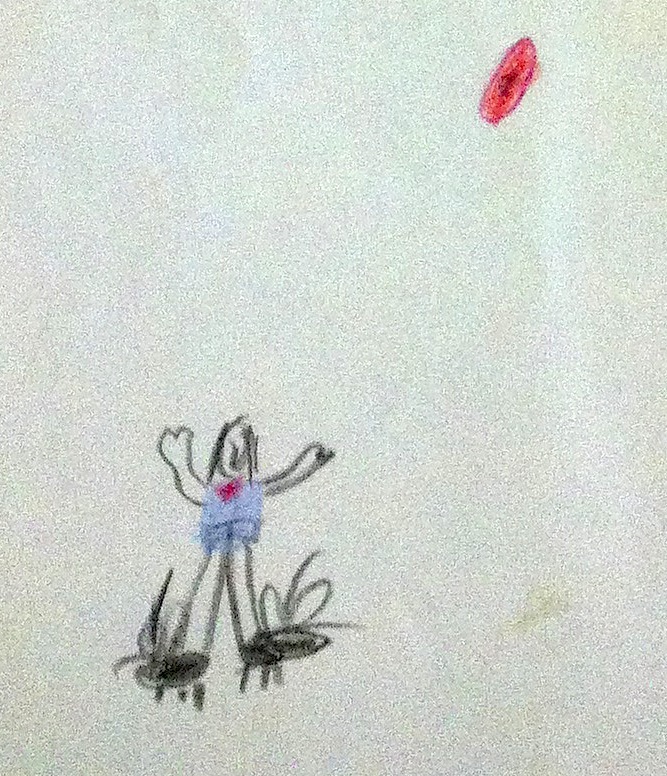 Drawn back in 1979, these are the grand finalists in his ‘dice footy’ game; this the winning goal. It’s Collingwood’s Billy Picken looking to smother, and most likely Glen Hawker about to cover himself in glory. 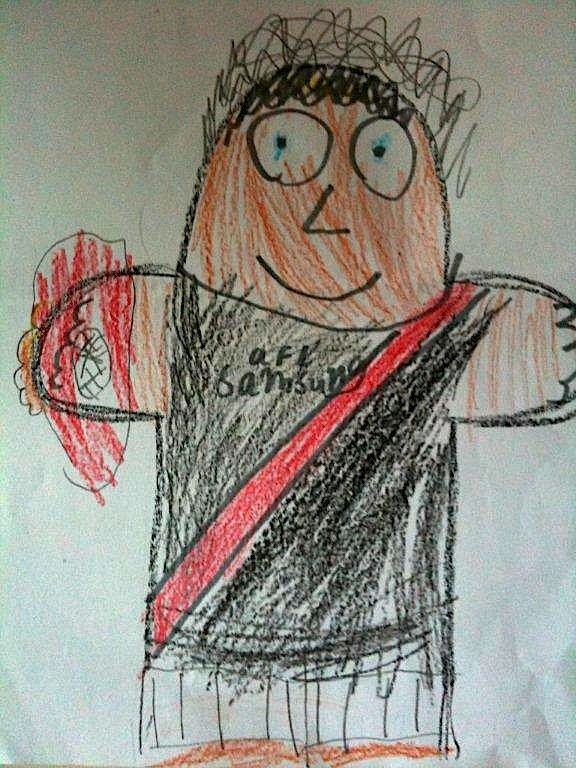 Fast forward through the 80’s, 90’s and 2000’s and we arrive at a drawing of Pie star Dane Swan by 7 year old Aven. Sent to me on twitter by his father and Pie nut @M_itch, I was really taken by the accuracy of the body proportions and stance. By 7 I’d just graduated from stick figures! And another tick for the young man, he’s forgone the club jumper sponsors! Expect a phone call from Eddie McGuire, Aven! 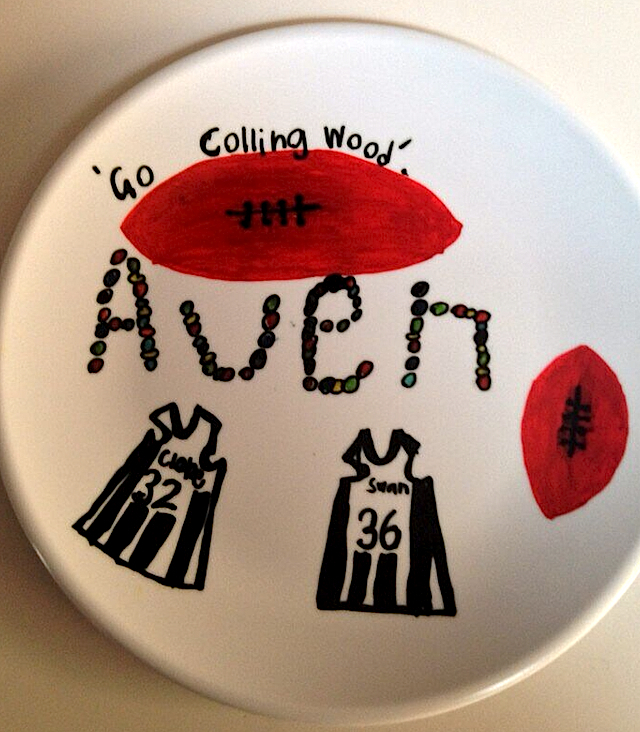 The above picture was printed for safe keeping onto canvas, whilst we continue with another clever way of immortalising your child’s artwork, some more magpie artwork by Aven, with Cloke and Swan clearly the stars in his eyes. Now we come to one of the more spectacular parts of footy and one which the artistic eye can really have some fun with; the speckie! We’ll kick off with some of ‘brother Pete’s’ little ‘speckie sketches’ he doodled as a boy. The top left shows a sensational pack mark, complete with a melee breaking out on the wing. We move clockwise to find a most sensational grab taken over the pack, but I’d like to draw your focus on the player on the left. Could it be Nick Holland and his dodgy shoulders? And finally, bottom left, we have the iconic Gary Ablett v Melbourne FC pack mark from 1989. Here’s one I drew back in 1990. It’s a little confused, but what I think I’ve done is take Michael Mitchell’s mark of the year against Fitzroy, and substituted the Roys for Melbourne. Why? I can’t say. I can tell you that David Cloke is looking lost in the middle of the ground while Jimmy Stynes (11) and Mark Lee (1) are moving towards the contest. I love the desperation of the Melbourne player trying to smother, whilst apologies to Michael Pickering (dunny brush haircut, no.35) and Craig Lambert (no.4) for their rather ‘plump’ appearances. 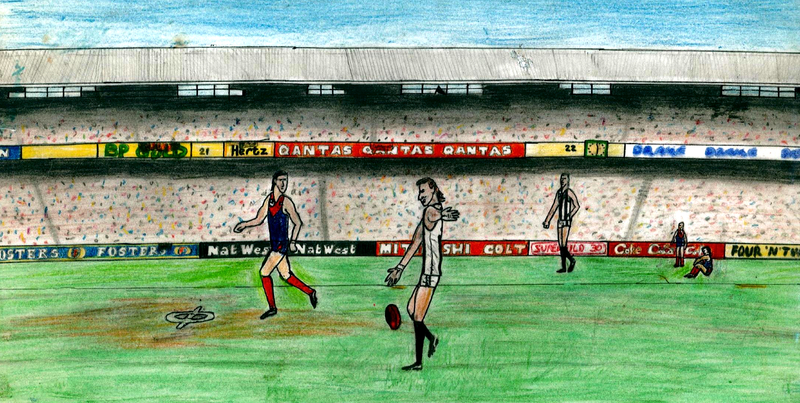 One of the best mark of all time, Shaun Smith’s 1995 screamer at the Gabba, was beautifully depicted again by ‘brother Pete’ (@carr_pete) in this unfinished drawing. Though goal umpires are to remain neutral and unphased by the play, this umpire can’t hide his reaction to seeing Smith’s bird-like feat. Keeping with aerial feats of magnificence, this painting was sent to me by Sean depicting Merv Hobbs iconic mark in the 1961 preliminary final. 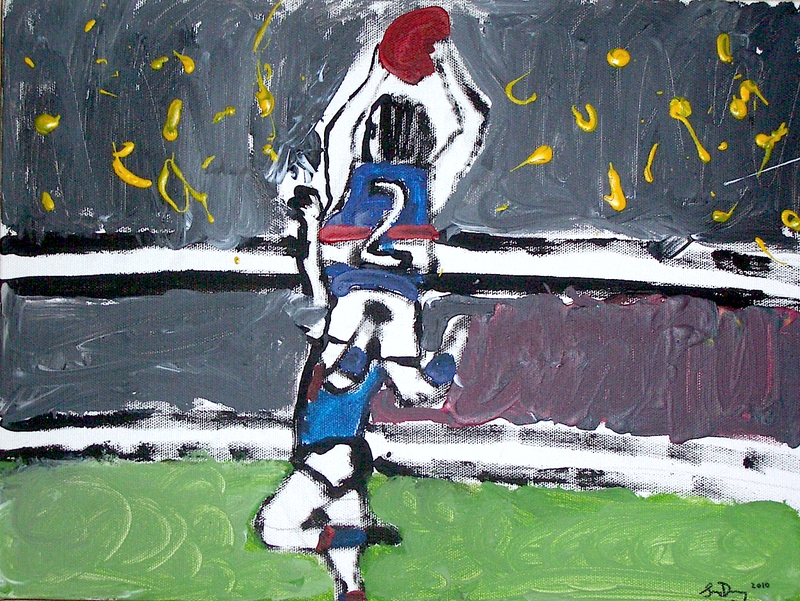 Sean, a Dogs supporter, was 10 at the time of painting (2010) and was stuck for something to paint. His dad suggested this mark (great parenting in my opinion) and the rest is history. Sean also points out the Merv Hobbs ran a printing business in Williamstown for many years called ‘High-Mark Printing.’ I think we can see why! Merv Hobbs mark on the left, and a similar style mark covered in a recent post! Finally we turn our attention to footy grounds, stadia, the crowds. 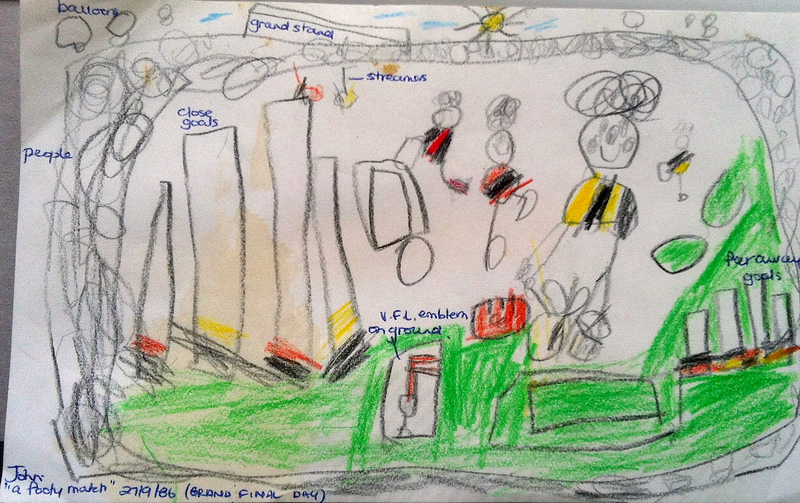 Below is a picture done by my daughter Molly, 6, just a few weeks back, simply of ‘the football.’ Note the gorgeous placement of the light towers, whose globes look much like the heads in the crowd. This is Richmond verses ‘Poo-ingwood’ as she at times calls them. 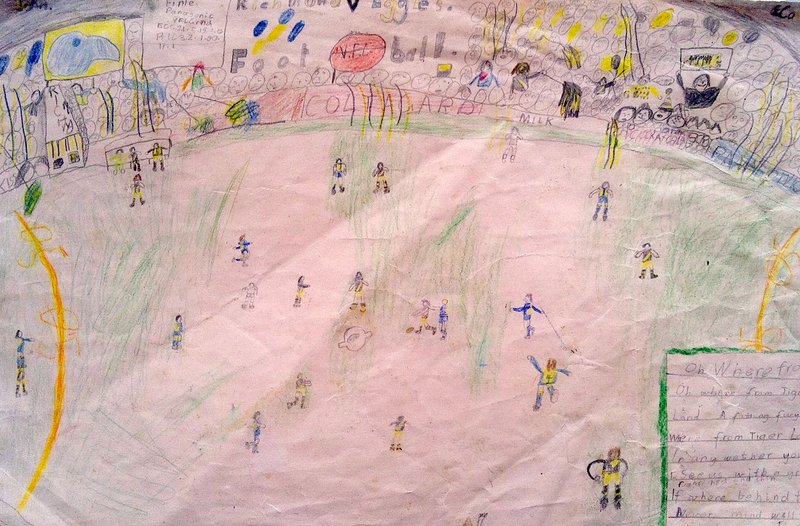 Here’s a collection of footy ground drawings I churned out in the mid 90’s. Top left must have been drawn after we’d ended up in the nose bleed section of the Southern Stand, when you could still look across and see the city. To the right we have what was a made up ground, which on reflection looks a little like York Park down in Launceston. And below that is one of MANY footy grounds I ‘designed’ full of little nooks and crannies, pokie stands and at times, architectural impossibilities. Now I had nearly finished putting this post together when I received an innocuous email from Jeff Dowsing, wondering if I was still after football drawings. ‘Sure’ I said, but I can’t say I was prepared for what I received. Jeff sent through 16 detailed drawings he drew during the late 80’s whilst in year 7 and 8. I’m only sharing the ‘best of the best’ here, although I encourage you to visit his website where you can see more. Collingwood features in each picture, but don’t let that put you off! I’ll basically let Jeff’s images do the talking, but the attention to detail, the intricate crowd work, the colourful advertising hoardings and the positioning of the drawings, as if Jeff was sat there in the middle of the action, are just fantastic. Top left we have Carlton and Collingwood at the ‘G (note the few spare green bench seats in the 2nd tier of the western stand) whilst to the right of that we see Darren Millane slamming home a goal to the Punt Road end, the old Southern Stand in all it’s glory. Below that we find a scene from the old Western Oval, the old EJ Smith stand in the background, and to it’s left we have the Pies taking on the Roys at Victoria Park, Millane again taking a towering mark. Finally we have the Dees and the Pies at the MCG. I grew up with the old Southern Stand and remember it fondly, and love that it features heavily in Jeff’s works. What really captured my attention here however was the Melbourne player who’s just given up, sitting on the turf like it’s the under 9’s, as the ball moves down the other end. While the crowd work is not as intricate, the passion is still there in this piece my brother and I did back in 1995. It appears that Footscray are well on top of the Cats, perhaps we were trying to re-write script for the 1994 Footscray v Geelong final? Well we’re nearly done. Thanks so much to all contributors, without your help this post would never have gotten off the ground. I’m still interested if you have any football drawings lying about, perhaps your parents have kept stuff you’re not aware of, and will happily add them into this post should they surface. 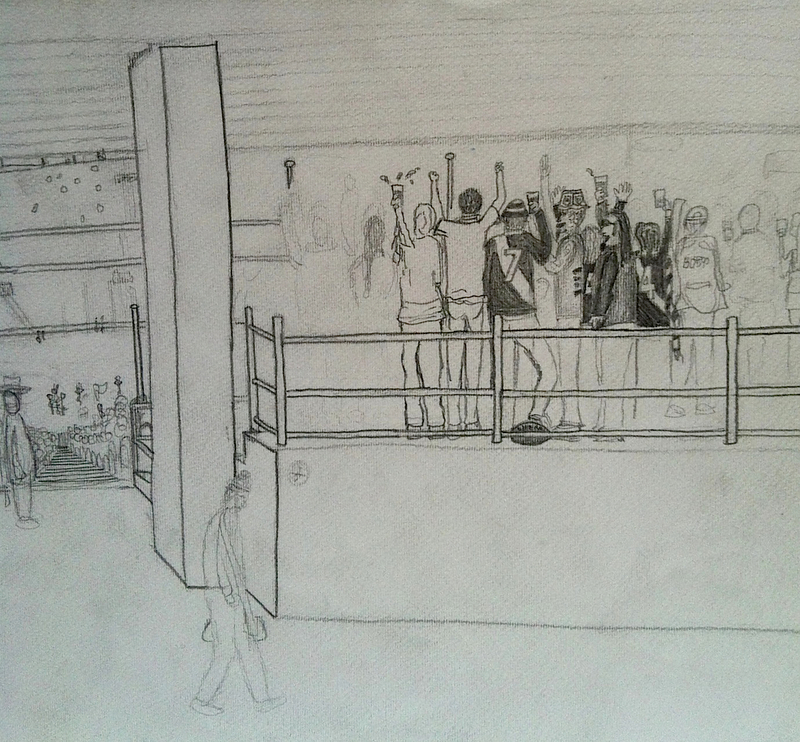 I’ll leave you with this unfinished drawing I did in the early 2000’s of the Richmond grog squad down the Punt Road end of the MCG. I stood there for a time and just loved the singing, the chanting and the passion. That’s me wearing the long sleeved number 4, although to be honest I was usually squashed in down the front, shorty that I am. Hopefully this scene of joy will be replicated tomorrow night at the MCG! It’s never too late to contribute to this blog. 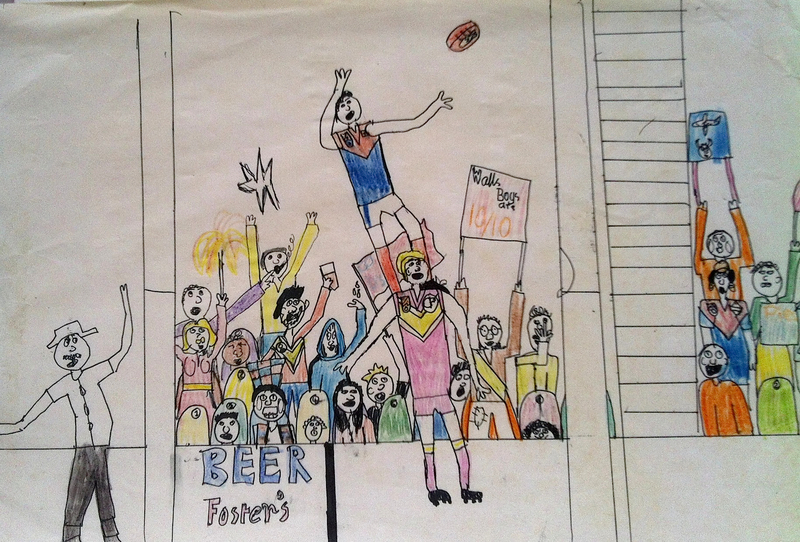 Richmond supporter @dugaldjellie on twitter yesterday sent through these two wonderful drawings his mother has kept from the late 70’s. The first appears to have been inspired by the famous mark by Disco Roach against Hawthorn, the second is of a Melbourne v Richmond clash in 1979. Please keep sending your pics in!! 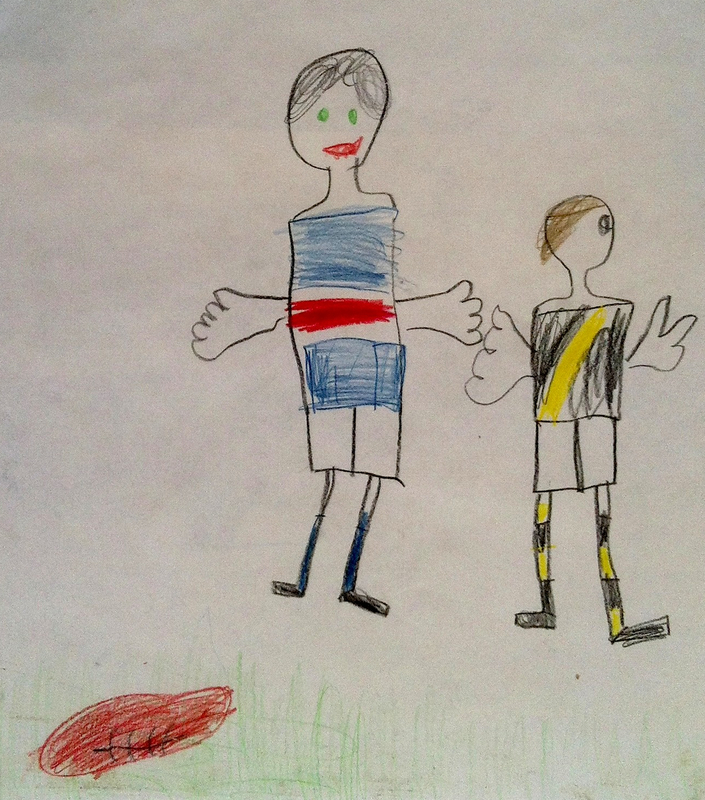 This entry was posted in Boots Happy Snaps, Musings and tagged afl, art, childhood memories, children, colours, drawings, Footy, grog squad, Jeff Dowsing, Kids, MCG, paintings, Pete Carr, Punt Road End, smells, speckies, VFL Park, Vic Park, Western Oval by theholyboot. Bookmark the permalink. Absolutely LOVED this post. So glad to see that it looks like other mothers (not just me! 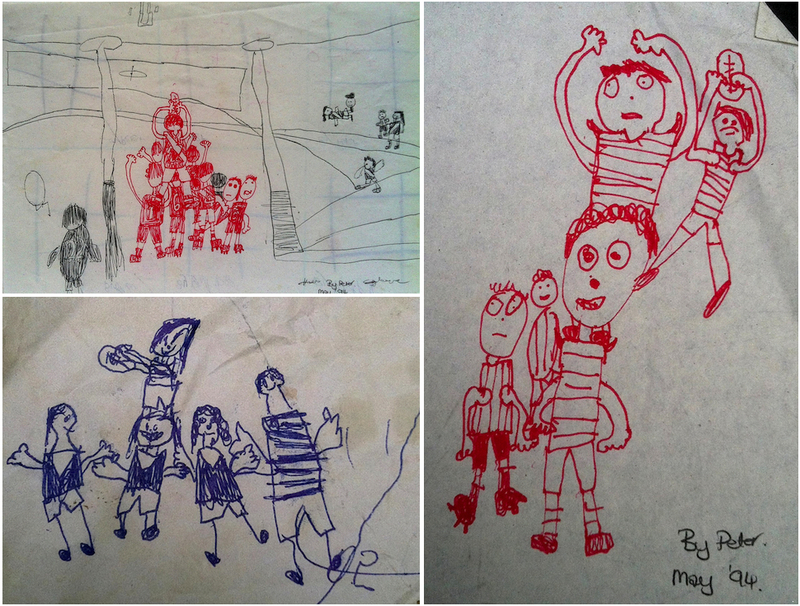 ), kept their childrens’ artwork…..so glad we did! And it just keeps going through the generations…..some things don’t change that much, thank goodness. Photos are a great way to capture a moment, but young children have an uncanny knack of showing us a moment through their eyes and from their perspective that can make us smile and still bring back great memories. Thanks for your hard work in collating it all for us to enjoy. – Been at the grog squad end… perfect rendition. – Scray ground even has the Hawkins wing coaches box! Detail! – The Merv Hobbs marks are excellent… lasting impressions. – So too the Shaun Smith (iconic) grab. …I could go on for ages. 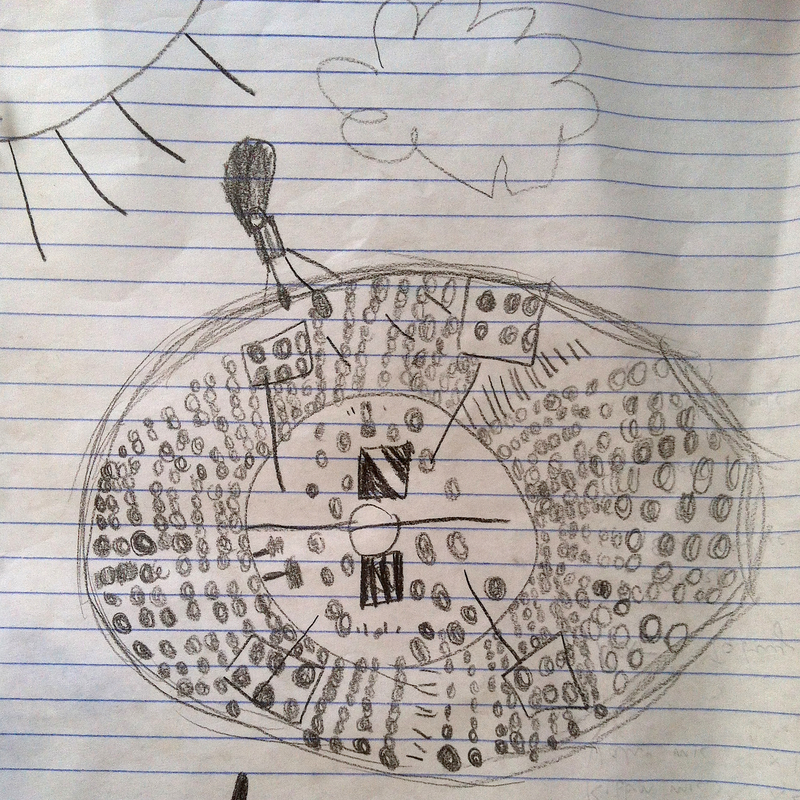 Thanks for including my early adolescent doodlings John, fantastic effort with this blog. I love the potential with your unique grog squad perspective, I implore you to finish it off!